More and more runners are talking about meditation or ‘mindfulness’ (a simple form of meditation and awareness) and how to use it while training and racing. Meditation is essentially the art of self-discovery. I have been practising meditation for the past sixteen years and have found that it helps me in many different ways. It was actually the reason why I started running in the first place and why I have been able to complete seven marathons. It has not only helped me to get through recent injuries, but also to overcome difficulties such as getting back to running after injury and staying motivated to run. It is the power of silence and peace acquired through my meditation which is helping me to face these obstacles. When we meditate we make our mind calm and tranquil using simple visualisation exercises and/or breathing exercises. It can be helpful to combine it with calming music. Meditation is such a vast subject and there are different forms of advanced meditation, for the purpose of this article I would like to keep it simple and share just four ways in which meditation could benefit your running. What do meditation and running have in common and how do they complement each other? 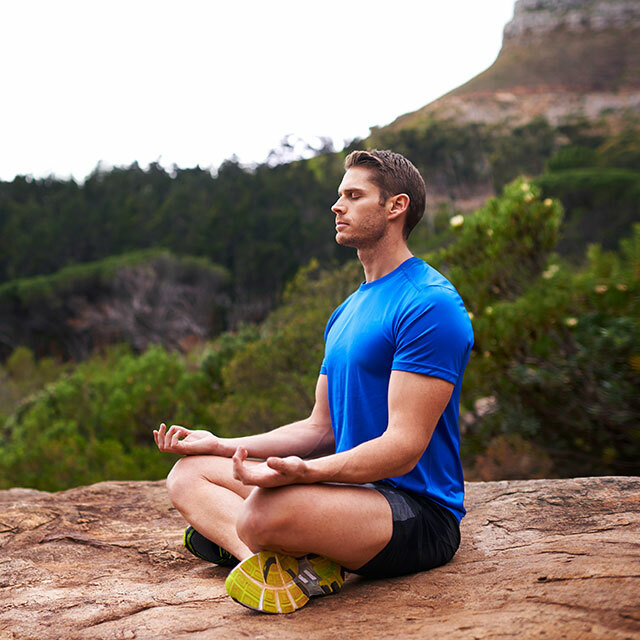 Without concentration we cannot be successful in running – the same is true for meditation. Concentration means inner vigilance and alertness. When we concentrate we do not allow anything to come between us and the object which we are focusing on. Similarly, when learning to meditate, we do not allow fear, doubt, worry and anxiety to come between us and our peace of mind, which is another reason to take up meditation in order to complement your running. When the power of concentration is developed, I can use it to chase away fear, doubt and other negative qualities from my mind. When running I aim to concentrate solely on the goal that I want to achieve, whether it is to run two miles or to complete a marathon. I try not to allow anything to cloud my focus. By strengthening my concentration through practising meditation, I can improve my running capacity. Focusing on the positive side of things frees us from discouragement, which enables us to achieve much more than we might have originally thought possible. In my training I want to steer away from the tendency to dwell on the things that go wrong. I just accept the fact that things won’t always go to plan but I can learn from this and try to fix any problems that arise. There is always a solution. This is where my meditation helps. In meditation you focus on positive qualities like peace, harmony or gratitude. The mind can be trained to enter a calmer state where you can observe your thoughts from afar, as if they were clouds passing by. Entering this state of mind you can find that your thoughts don’t define who you are – moreover you can choose to focus on the positive no matter what may be going on in your life. We know this is not always easy, but over the years I have found that training my mind through regular meditation practice has helped me achieve this focus and positivity in my running as well. Meditation teaches us to stay in the moment, which I find very useful for running as well. The present moment can often escape us because we lose ourselves in thinking about the past or worrying about the future. Learning to stay in the present moment is one of the most effective ways I have found to complete a race. To achieve this I simply focus on where I am running, taking in a few details. I am trying to be aware of what physical and mental state I am in right now using different techniques, for example focusing on breathing in and out really helps to bring my attention to being ‘here and now’. When we choose to surpass ourselves, rather than just surpassing our fellow runners, we can get real joy. This keeps me motivated in my running even after the race, because I always have a goal to better myself. It is exciting to see how far I can progress. Focusing on self-improvement while running gives me joy, helps me to stay positive and takes away the pressure of constant comparison with others’ achievements. I learnt to adopt this attitude through meditation and it is meditating for a few minutes before running that makes this attitude easier to maintain while running. When I spend a few minutes in silence before the race I feel more centred on myself and detached from expectations. These moments of solitude help me unimaginably. If you would like to try meditation I recommend you attend meditation classes first and then gradually introduce a few minutes of meditation before and after your run. You can also refer to books with meditation exercises to help your technique. You don’t need to sit in any special position, just sit comfortably with your spine erect but relaxed at the same time. Free meditation classes are offered by Sri Chinmoy Centres in London, Edinburgh and Cardiff. Here is a simple breathing exercise which is often used at the beginning of a meditation course. Focus on breathing in and out and gradually slow down your breathing. As you do this imagine that when you are breathing in you are absorbing peace and when you are breathing out you are letting go of restlessness. Just by doing this for a minute you might find yourself calmer. Another quality you can choose to breathe in, to prepare for your running, is power or joy. Imagine that you are becoming more energised by each breath as you are breathing in, and when you breathe out you exhale fear or sorrow. There are some world class athletes who have introduced meditation into their training, including one of the greatest track and field stars of all time – Carl Lewis. 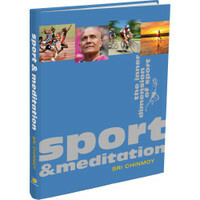 To get more information about this topic I recommend a book called Sport and Meditation by Sri Chinmoy.